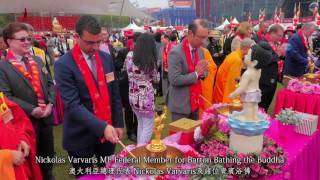 Every year when Buddha’s Birthday approaches a special event is held in celebration at Darling Harbour. Organised by FGS Nan Tien Temple, its various FGS branches in Sydney and the Buddha’s Light International Association (BLIA) Sydney. Thanks to greater public interest and the increasing support of members, devotees and the Darling Harbour Authority, the festival is now a two-day event.